17th Annual Conference on "Digital Transformation in the Corporate World: Strategies for Success" on 13th October 2018. It was graced by the following speakers: Mr. Vijay Rai( Chairman-Akola Chemicals), Mr. R Mukundan (MD-Tata Chemicals), Mr. Aseem Srivastav (Partner-Talent Assesment, Analytics Software Solution), Mr. Sajid Patel (AVP Datamatics Global) & Mr. G Narendra (VP-Microlabs) on the theme "Digital Transformation in the Corporate World: Strategies for Success"
International Research Conference on "Business and Environment: Sustainability Challenges and Prospects." held on 1st September 2018. Atharva Institute of Management Studies organized the 2nd International Research Conference on 1st September 2018. Atharva Institute of Management Studies witnessed the 16th annual conference on 10th Feb' 2018. The 15th Annual Conference on ‘Building World-Class Indian Companies and Competence: Strategising for the Future’ began with the ceremonious lighting of lamp by our esteemed dignitaries, followed by Ganesh Vandana. 14th Annual Conclave -2016 “Transforming India” started up with the lighting of lamp by Prof. NS Rajan & Dignitaries present and Ganpati Vandna. 13th Annual Conclave - Ashwamedh 2015 putting India back on the high growth Trajectory. The Dean, Prof.N.S.Rajan Sir gave a powerful start to the session by explaining the theme and discussing the current economic scenario of India. To bring about a change, he highlighted the importance of implementation because planning alone cannot suffice. He also threw light on the major areas of development such as technology, engineering and R&D. India needs to focus more on innovation. There are a lot of markets which are still untapped and can be exploited for growth and development of the country. he Atharva Institute of Management Studies(AIMS) campus witnessed a massive gathering at its 11th Annual Conclave-Ashwamedh 2014. Prof N.S.Rajan, Dean introduced the theme of the conclave, ‘Reimagining India-power in search of purpose’, which raised key issues facing the new generation on their expectations of a Vibrant India. Students had a wonderful exposure to contemporary knowledge and innovative ideas that added value to their skills and intellectual ability. Atharva Institute of Management Studies witnessed the 2nd International conference on 1st September 2018. It was a one day event. The morning session had four speakers . Two of the speakers gave virtual talks on the theme. One was Ms. Sheeva Dubey who is currently pursuing her Doctoral Research from University of Miami and she gave some research insights to the students. The second virtual speaker was Mr. Iftekhar Pathan from Pune who is the founder trustee of Aundh Institute of Medical Sciences and Director of Lorea Healthcare Pvt. Ltd. He discussed different perspectives of the theme. The third speaker Mr. Debashish Sarkar presented his ideas on *9 Must known truths for corporate sustainability.” The fourth speaker was Dr. Anuja Agarwal , Deputy Director, Marketing Excellence , Digital and Consumer Insights, Sanofi India Ltd , who discussed the innovative ideas in healthcare industry and macro forces of digital disruption". In the afternoon session, there were research paper presentations by research scholars, students and faculty members from various institutions. The paper presentations were judged by Industry experts. The event was divided into two sessions; first session was the panel discussion on "Developments in technology and impact on corporate governance" with 5 eminent speakers from diverse corporate groundings sharing their expert views. The discussion was moderated by Dr. Harshad Jadhav, Nestle Skin Health Care, who started with two buzz words innocence and curiosity that lead to developments in technological era. Mr. Anil Gachke Chairman of MEDC humbly gave his insights on evolution of technology and its need across sectors. He also emphasized on Block chain technology and its significance in corporate governance. Mr.Avinash Anurag, VP of SBI Capital Ltd, linked technology with capital markets and focused on impact of technology on chain or the structure of capital markets. Mr. Sumit Bhardwaj, senior VP of Citius Technologies Private ltd., gave technology an ethical aspect and stressed on adding human behavior to technology. Mr. Lokesh Chaturvedi, Managing director-COO, Societe Generale gave technology both financial and ethical. He emphasized on "Need for Speed Leads to Innovations, And Innovations Leads to New Technology".Mr.Jadhav, moderator gave valuable learning to the students i.e. every vulnerability becomes an opportunity. He concluded the panel by saying" you have to be high-tech but at the same time high touch". The second session brought in the entrepreneurial skills in developing technology. The first speaker was Mr.Jeevan Varma Master Trainer, Ex VP, Reliance Communications Ltd. He explained various concepts of modern technology like Chat bots, AI& ML, customer experience and so on. According to him the way to survive in automation world is to be agile and to polish soft skill and cognitive abilities. The second speaker Ms. Mona Ghosh Shetty President, Sound and vision India Private ltd. narrated her challenging yet successful story. She inspired the students to be ready for all challenges. The conference was well appreciated by the audience comprising both students and corporate personalities. It provided a unique forum for the sharing of information and ideas for the best and most promising practices in technology. The 15th Annual Conference on ‘Building World-Class Indian Companies and Competence: Strategising for the Future’ began with the ceremonious lighting of lamp by our esteemed dignitaries, followed by Ganesh Vandana. Our Dean Prof. N. S. Rajan delivered the inaugural speech and welcomed all the speakers. He emphasised on how the future of world-class organisations lies in innovation and adapting to the changing environment. Mr. Shailesh Haribhakti, Founder & Chief Mentor of Bakers Tilly DHC Pvt. Ltd., in his speech laid emphasis on ‘Abundance of everything in today’s world’ and other aspects such as Exponential Forces, Do It Yourself innovators, Techno-philanthropist and Rising Billion. Prof. Dr. Dewanand Mahadew, Managing Director, DCIB and Professor of UBIS, Switzerland, gave a lecture on ‘Global and Indian Economic Scenario’. He emphasised the need to create a local economy by understanding mega trends, smart cities solution, safety mobility and environment. According to him, strategy is about making things happen with the available resources. Dr. Sumit Ghoshal, Contributing Editor, Business India, stressed the necessity to create global mindset by thinking beyond the national boundaries. He elucidated the needs of changing habits and keeping oneself open to learning. Mr. Nitin Bhagwat, Vice-Chairman, FCB Ulka Interface, talked about the importance of Indian brands to earn international presence. Indian brands can become global by adapting right branding strategies such as creating a country specific competency, leveraging the Indian Diaspora, building digital competency and developing ethical brand. 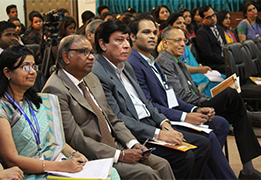 The conference was well appreciated by audience comprising both students and corporate personalities. It generated a lot of ideas about how to continue to expand our skills. It was a great learning experience and a very insightful and extremely informative session. The Event has three panel discussion. First panel discussion was on topic “ Start Up India, Stand Up India”, the panelist were Mr. Shishir Jain, Managing Director, CX Consultancy, Mr. Ankesh Kumar, Director, Product Management & Marketing, Emmerson Network Power Ms. Anupriya Nayyar, Creative Writer & Coach & the Moderator was Mr. Jacob Shetty, Director, International Centre for Culture & Education . They discussed the key changes taking place in the startup scenario of India. Discussion highlighted the ability of us Indians to innovate and encouraged all of us who have been sitting on the fence to start up and make a difference. Its time for the start up’s in India to Stand Up and deliver. Third Panel Discussion was on Topic “ Employee Retention : Changing Approach”, the speakers were Mr. JKP John, Head Talent Management, Aiana Hotels &Resorts, Mr. Debabrata Majumdar , Head Distribution, Dani Investment Securities, Mr. Parag Gadhia, Speaker, Coach, Entrepreneur & Facilitator & the Moderator for the panel Discussion was Mr. Sajid Patel, AVP Head Employee Relation and L&D, Datamatics. The panelist discussed that the Business paradigm is virtually in every department, modern business has been undergoing continuous change, the labor pool is changing drastically. Monetary incentives are not the only thing but regular interaction to retain the best talent and policies not acting as a barrier is the trick to employee retention. The good strength of students was gathered for the event & they had learning of various aspect of transformation taking place in India. The event was concluded with National Anthem. The Atharva Institute Of Management Studies organized a National Research Conference on the theme “Emerging Patterns Of Innovation In Businesses: Challenges And Strategies” on July 19th, 2014 with an intend to provide a platform for academia, industry professionals to share, deliberate and discuss the emerging patterns of innovations in businesses, challenges faced and the different strategies used to bring business transformation in the global market. The broad themes for the conference were: Debt Restructuring, Microfinance, Financial Sector Reforms, Innovation in Service Organization, Consumers perception towards Global products, Creativity and Innovation in Marketing, Innovative tools and techniques in training and development, Innovative employment engagement practices, Cloud Computing, Mobile Computing. The research papers were invited on the above themes. It was a successful event wherein we received a very good response from the management institutes in Mumbai and the corporates as well. We received 100 plus research papers and the presentations of the research work were conducted in different classrooms for different streams. It was overall a learning experience for the students with an exposure to the latest trend in every field with respect to the industry which helped them to enhance their intellectual as well as research skills. Date: 17th January 2015 Venue: Atharva Institue of Management studies Theme introduction: Prof. N.S.Rajan, Dean, AIMS Chief Guest: Mr.Sailesh Haribhakti Session 1: Unlocking of value and investment potential in the securities market by- Dr.Dhanraj Uchil Session 2: Managing the demographic dividend in India by- Mr.Saidutta Nanda Session 3: Changing Paradigms of marketing for Indian Consumer by- Mr.Ramkrishna Iyer Atharva Institute of Management held the 12th Annual conclave- Ashwamedh on 17th January 2015. The Dean, Prof.N.S.Rajan Sir gave a powerful start to the session by explaining the theme and discussing the current economic scenario of India. To bring about a change, he highlighted the importance of implementation because planning alone cannot suffice. He also threw light on the major areas of development such as technology, engineering and R&D. India needs to focus more on innovation. There are a lot of markets which are still untapped and can be exploited for growth and development of the country. The Chief Guest Mr.Sailesh Haribhakti then shared his vision on the future of India. He made us believe that by 1st April 2016, India will be the fastest growing Nation. Our Prime Minister’s dream “Make in India” is definitely going to bring our country back on the high growth trajectory.But, as sir rightly said, we must not only make in India, but also make for India, and Own in India. He highlighted on various important sectors of the country, where if laws related to taxation are regulated, then our country shall never face a fiscal deficit. He also gave recommendations to improve agriculture on which the major portion of our country’s population is dependent, as this would put India on the growth path. The first speaker for the day was Mr.Dhanraj Uchil. He spoke on “unlocking value and Investment potential in the securities Market”. For this, there should be clarity in the regulator’s objectives and mission. The fact whether India is on high growth trajectory is depicted by economic and relevant indicators, Perception and feel good characteristics, and expert views. Trust, Transparency, clarity, consistency and predictability are required for India’s growth and development. The second speaker, Mr.Saidutta Nanda spoke on “Managing the demographic dividend in India”. India’s major population is youth and of productive age group. This gives us a demographic advantage over other countries. This youth has increasing income, which in turn increases the GDP of the Nation. The pharma industry is also booming. It is highly regulated, knowledge and skill based. He made us realize the need to bring about synchronization in the education system and industry requirement. He emphasized that this demographic advantage of the country must be taken as an opportunity rather than a guarantee.He also mentioned about the challenges and corrective actions necessary to be taken to make this youth a demographic advantage. The last speaker Mr.Ramkrishna Iyer came with huge enthusiasm and filled the atmosphere with a new energy when he spoke on “Changing Paradigms of marketing for Indian consumer”. A revolutionary change has been witnessed in the Indian market. There has also been a change in the traditional concept of 5 P’s of marketing, to the incorporation of many more P’s. The Gillett story narrated by sir was indeed a great example of the changing paradigm. Improvement, upgradation and Innovation is the key to success. However, it is also important to make sure that the Paradigm Paralysis is avoided. Marketing Paradigm has also changed from pushing products to delivering solutions. People have also started accepting e-commerce. Sir made his session even more understandable because of the wonderful examples mentioned by him. So, I think it is safe to say that in the 21st century, it is the customer who is he KING. Hence, we can conclude that India is definitely on the path of high growth trajectory, but there is still a long way to go. And I am sure with a youth like us, we are definitely going to Make a change. Two teams from Atharva Institute of Management Studies were selected as Western Regional Round winners to participate in the National Competition for Management Students as a part of the 11th National Competition for Young India organised by the All India Management Association at Delhi on 26th September, 2014. The presentations were themed around ‘Innovative Youth driving the Nation’s growth – Role of Young entrepreneurship in India”. The two teams consisted of Ms. Sujona & Ms. Lekha as well as Mr. Jaiswal & Ms. Shivangi, all students of MMS 1st year won the Western Regional round on 18th September, 2014 and faced off against hectic competition from the leading Business School in the Western Region. The winners at Mumbai were felicitated by Dr. P.P.Joshi, Director, AIMS and Dr. Bhattacharya, Director, ASB in the presence of distinguished Judges and officials from All India Management Association. Atharva Institute of Management Studies actively participated at the Inter-Collegiate event held at Thakur Institute of Management Studies. The event had participants from various institutes across Mumbai and AIMS students participated and won awards in many of the events. Out of the many events a team of students participated in ‘WAR CRAFT’ event and emerged as a winner. Participants were given different topics of crisis. Based on topic participants had to think about an idea for startup of product/service and design a logo for it. Also they had to decide target market, selling price & promotional strategies too. The judges appreciated their idea of “Warm Helping Hand” and they secured the fist place. They also participated in ‘BE THE NEXT CHANAKYA’ HR event and won the 1st runner up prize. There were students from MET, Xavier’s, Chetna’s, Dalmiya, Thakur etc. There were 4 rounds. The students of AIMS performed well and got appreciation for their performance in all rounds. All in all it was a wonderful experience for the students. It helped them in improvement in confidence level, their analytical skills and communication skills. Kudos to the AIMS students!! SS&C Globe Op Financial Services, who is a regular recruiter at Atharva, had conducted CAII Program for MBA finance students of the third semester. Globe Op Financial Services is of the opinion that students need some basic classroom training regarding the company and the company operations before going into the battlefield. For this reason, the company was kind enough to come to our campus and train the students in a variety of areas like Fund Accounting, Operations, OTC Derivatives, Valuations, etc. They gave the students in depth practical training on the subjects pertaining to their job responsibilities. Students had a wonderful experience and they now have an edge over the competitor students as they already have in depth knowledge on a lot of topics. After the sessions, the company had evaluated students by conducting a test and 25 students of 32 students could successfully clear the test and it was followed by a certificate distribution ceremony. The ceremony was held on 11th January 2017. Globe Op representatives Mr. Sunil Nair – Director HR, Mr Willis D’Cunha – HR Representative and Mr. Sasmit Ghodke – HR Representative were present to give away the certificates along with Our Dean Prof. N. S. Rajan. "The Brave New World: How Analytics is Transforming Business"
Analysis is used in marketing, consumer behavior, finance and risk, HR, business operations and logistics. An Analytical mindset is of more importance than tools, systems and programming used in the organization. Analytical mindset is the need of the hour by the management. To understand this better, the Atharva Institute of Management Studies had organised a guest lecture for the MMS and PGDM students on 17th January 2017. The guest of honour, Mr. Santosh Mishra, Principal Advisor-Human Capital Foundation and a seasoned professional with 14 years of experience across top MNC’s and start-ups had an interactive session with the students of AIMS. Mr. Mishra shared his inputs on how an analytics study helps in predicting public policies, crops and bank loans, etc. We make data of what we see and it has equal pros and cons at the same time. Analytical study gives us different sets of view points to take right decisions. Analytical study is not about data but actually it is the raw material that makes the data. There are various problems in organizational life like leadership, fluctuations in stock prices, market share and labour turnover; for which proper remark and tools is the solution. Analytical study is the combination of art and science. Better programming results in better performance. Technical and non-technical people should work together and make productive results. An organization needs strategic thinkers, project managers, and people with consulting skills to prosper. In the coming years, IoT (Internet of Things) is going to be implemented and it is estimated that it will generate a business of $ 34 billion. Relevance of data matters a lot. It is very important to identify, apply, design solutions accordingly. For example: Amazon that has a well planned logistics. CEO resiliency, attrition, retention value, hiring patterns should be the prime focus of the organization. Importance of qualitative data, business linkages and workforce planning was also explained. Automation will come where the labor is scarce. Competition is between the one’s who are regressive and not progressive. Sentiment analysis has been newly included in the organization, in which the sentiments of the employees are identified. Strategic analysis, machine learning, combination of business knowledge and data query techniques are some solutions that can be used by the organizations. The PGDM Batch 2016-18 of Atharva Institute of Management Studies organized a book launch of German language on 22nd December, 2016 in the institute. The event was officially commenced with Dean N.S. Rajan Sir cutting the ribbon, formally inaugurating the event and Prof. Amruta Pise briefing about the sessions conducted by her. The book comprises of introduction and conversations in German language with their English translations. The team leaders of each group alongwith their class representatives highly contributed in the making of the book. Few students gave their feedback which was documented in the book. Each student spoke about themselves in German which was followed by a group conversation in German alongwith their English translations. All PGDM students acknowledged Shri Sunil Rane Sir, Executive President, Atharva Group of Institutes, Dean N.S. Rajan and Prof. Amruta Pise for giving the opportunity to learn a foreign language which would enable them to communicate with people at a global level. All the faculties and Dean Sir appreciated the efforts taken by the PGDM students. AIMS Students attend BMA Event on "What Women Really Want"
In an event organized by BMA, female students at Atharva Institute of Management Studies attended the one- day Women conference. The event was held at The Leela Hotel, Andheri on 6th Dec 2016. The theme of the conference was “What Women Really Want?” which was attended by 150 delegates comprising of CEOs, CFOs, CIOs, management Consultants, Faculty Members and students. Ms.Mona Cheriyan, Chairperson and Speaker at the conference, beautifully explained what a woman goes through when she has to manage her job & home, hand in hand. The students learnt how to maintain Work-Life balance. The women are supposed to perform well in all aspects of life – work, society, family. The knowledge gained by the students will be beneficial to them in their future life. The students also volunteered in several Technical and other organizing activities. In one of the activity, they asked the participants to write about the events in a line, on the board. The participants were very enthusiastic and the board was filled in no time. The students also had a one-to-one interaction with Ms.Mona Cheriyan, who gave them insights on network building and personal development. There were several other speakers like Ms Apurva Purohit, Ms Sonali Kulkarni, Mr. Suresh Srinivasan and others. In the end, the feedback and suggestions were taken from the participants, to make the event better in the forthcoming years. The students had a great learning opportunity and enjoyed thoroughly. Students of Atharva Institute of Management Studies celebrated the National Milk Day in commemoration of the 95th birth anniversary of Dr. Verghese Kurien, popularly known as the “Milkman of India”. The event was held on 28th of November 2016. The event was held in collaboration with Amul, the leading brand in the dairy industry in India. Students were asked to make research presentations on any one of the three topics provided by the Amul team as given below. These presentations were initially screened by a team of junior managers from Amul as well as AIMS marketing faculties. Top 10 presentations were nominated to be presented in front of special delegates representing Amul, who had visited the campus for the same. The Amul delegates praised students for their stupendous effort and flawless research acumen and appreciated the depth of information that was incorporated into their presentations. The participants were awarded certificates and Amul gift hampers in appreciation of their efforts. Mayur Patel (MMS-Sem 1) & Smit Mehta (PGDM-Sem 1) were the top 2 presenters of the event. The event was successfully organized and executed by the AIMS CMC & Marketing teams. The AIMS Marketing Team conducted an “Application Based MS Excel Training Program” for the first year PGDM students. The program was a part of the year-long “Marketing Student Development Program” (MSDP) which was designed by the marketing faculties to impart knowledge and specific skill sets to students ensuring their readiness for corporate world. The training program was conducted over a period of two days 22nd & 25th of November 2016 by Prof. Ratheesh Nair, ably supported and guided by Prof. Abhay Desai & Dr. Paul Rosario. The training was majorly focused on providing students with a basic understanding of excel, usage of excel as an analytical tool for business and market analysis. Another major focus of the training was on making students use excel using only the keyboard for data input and navigation. This was done to help students become proficient and effective in the usage of MS Excel to make MIS reports and conduct faster analysis on large amount of data. The training started with an orientation from Prof. Abhay Desai on the importance of MS Excel as an analytical tool in various industries and job roles. The first part of the training was a classroom session where the students were given a live demonstration on usage of various shortcuts and graphical tools. The second part of the training included an hour long practice session for each student. A few students with better proficiency in MS Excel were identified as facilitators and were assigned the job of assisting the other students during the practice session. This training marked the end of the first phase of MSDP. The PGDM Batch 2015-17 of Atharva Institute of Management Studies visited the most happening city in the world – Shanghai, China from 15th to 21st November 2016. During the visit, the students visited various international companies like Coca-Cola, Bao Steel, SWFC, Yakult, and Volkswagen, Shanghai International Port and also the premier University of Jiao Tong and largest Silk factory. The students got an opportunity to explore the areas of infrastructure, industrialization, transportation, logistics, shipping, Manufacturing and how they discipline themselves to be the one of the leading county of the world. Mr. Sunil Rane, Executive President a man with a vision and foresight showed the way to students by giving them an opportunity to explore and understand the various manufacturing units, logistic companies and universities in Shanghai. Mr. Sunil Rane has been in the forefront in promoting such international visits. Our students due to his dynamic approach had visited China in 2007, 2014 and now again 2016. In 2015 our students had visited Seoul South Korea. His approach is to facilitate students to explore management areas and build a better Future in the companies they work, and also be a better human being. He wants the students to learn how the citizens of other countries discipline themselves by following civic rules as laid down in their country. The students besides visiting companies for building their competencies also had a river cruise on Huangpu River and also a visit to the Shanghai Financial Convention Centre, the highest building in the world. The Atharva Institute of Management Studies has organized ’Global immersion to China’, an international industrial visit for the PGDM students of batch 2015-2017. In regards to this, AIMS arranged a special session for students with the purpose of better learning and to get well versed with their upcoming visit. The Executive Director of India China Chamber of Commerce and Industry (ICCCI), Col. Rawat along with Ms. Snehal Kulkarni who is a Chinese instructor, visited the institute on Tuesday, 9th November, 2016. The session started off with students giving presentations on how they will carry Atharva brand, what will be the learning outcomes from various company visits, what they will share with their fellow mates and what research they will be doing. Also Ms. Snehal Rawat, being a Chinese instructor taught students few words of Mandarin ni hao(hello) and xie xie(thank you) that will help them while travelling. Lastly, Col Rawat wished students a bright future. He further mentioned that Atharva has a lot of potential and is one of the best institutes in terms of infrastructure, amenities, etc. The Atharva Institute of Management Studies thanks the dignitaries for sharing their expertise. Atharva Group of Institutes organized Diwali Get together on 28th October 2016. The get together was a great initiative taken by our Executive President Shri Sunil Rane Sir. It was attended by all the staff members of all the Atharva Group Institutes like Atharva college of Engineering, Atharva College of Hotel Management and Catering Technology, Atharva Institute of Management Studies, Atharva School of Fashion & Arts, Atharva Institute of Film & Television and Atharva Institute of Information Technology. It was a great opportunity for all the staff members to interact with each other and get to know each other. Few staff members were felicitated by the management for their contribution to the institute. It was a proud moment for Atharva Institute of Management Studies as “Prof. Priyanka Patel” was felicitated as the “Best Faculty” and “Mr. Prakash Bhatkar” was felicitated as the “Best non-teaching staff”. The event also had few inspirational messages from Dr. Pravin Nemade, Dean, Atharva College of Engineering; Dr. Shrikant Kallurkar, Principal, Atharva College of Engineering and Prof. N. S. Rajan, Dean, Atharva Institute of Management. Guest Lecture on "Skills to Succeed in VUCA World"
HR Club of Atharva Institute of Management studies organised a guest lecture on "Skills to Succeed in VUCA World" by Guest of Honour Mr. Charles Carvalho on 8th October, 2016 under the guidance, direction and support of our Dean Shri N.S.Rajan. Mr. Charles Carvalho not just cleared what the VUCA (Volatility, Uncertainty, Complexity, Ambiguity) world is all about but also gave insights on how to sustain with the KSA’s i.e. Knowledge, Skills and Attitude one possesses. He stressed on some of the essentials Meta skills like communication, accounting, psychology, design (the basics), technology, happiness, health, emotional intelligence, etc. which is required by every future manager in order to survive and succeed in the VUCA world. Also he stated that it is very essential to constantly upgrade yourself, keep learning, accept challenging projects, and use social media intelligently. He briefed upon some of the useful websites and mobile applications for developing these skill sets. The guest speaker kept the session very lively and humorous. It was indeed an inspiring and thought-provoking session for the students. The guest was overwhelmed and pleased by the hospitality extended by the AIMS family. Development of Skills is a necessity for the young managers of today. To elucidate on this topic, the HR Club of AIMS arranged a guest lecture on ‘Insights on Skills required by future Managers’ on 1st October 2016. The speaker for the lecture was Mr. Manoj Sharma, Ex- Senior Manager HR (Tata Consultancy Engineers). Mr. Manoj Sharma provided imminent views on how to develop skills and emerge as a successful manager. He elaborated on how a person should have “Never say Die” attitude and should always be keen to learn newer things. He further added that it is always attitude that takes someone to the new heights of success. The overall Session was interactive wherein the students got an opportunity to clarify their doubt on the ways to prepare them for their career. It’s a proud privilege to share that the first Convention was organised at the Atharva Institute of Management Studies on Tuesday, September 27th by the Marketing Department under the guidance, direction and support of our Dean Shri N.S.Rajan. The Marketing Convention discussed about how the ecosystem of business nurtures creative ideas for starting enterprises and the impact that it has on marketing products and services innovatively. The guests of honour were Mr. Nazim Sawant – Co-founder, India Entrepreneurs Club, Mr. Joe Pan – CEO, Pansworld Television, Mr. Deepkumar Janardhanan – CEO/CTO, AGIL and Mr. Uday Wankawala – Advisor with Entrepreneurship School & Academic Incubators. The speakers made a significant contribution to the thought process of students and their doubts removing their worries and giving huge motivations to start their own business. Mr. Nazim Sawant motivated the young students of AIMS by saying that it’s never too early to start your own business and there is no right age, just go for it! Mr. Joe Pan highlighted that talent can only take you to a certain level beyond that it’s your hard work and determination that keeps the enterprise alive so the job doesn’t end after setting up your own company. Mr. Deepkumar Janardhanan spoke about how to deal with failures, bounce back out of them and develop the proper mindset and work outside the comfort zone since situations are always dynamic in nature. Mr. Uday Wankawala emphasized on building up a strong network and developing more contacts. The experiences shared by the speakers enlightened the students and also inculcated the sprit of entrepreneurship in them. The Marketing Convention summit ended with a huge uproar in students to start their own business. The Atharva Institute of Management Studies (HR Team) conducted its 1st ever Model United Nations on 25th September 2016, organized by Prof. Pooja Patil. More than 80 students participated who were assigned various member countries of United Nation. Organising committee headed by our SEM III HR student Arshi and Tejal did a commendable work in organising this event. Economic and Financial Affair Committee chaired by Prof. Radhika Rai on the agenda BREXIT- effect on world economy. Human Rights Commission chaired by Prof. Reena Poojara on the agenda Child labour- an understated phenomenon. Both the committees were vice chaired by Miss. Arshi Hussain (MMS HR SEM III student). The committee’s deemed as charming, waiting to catch something interesting from the discussion. The day went off with plain discussions to severe arguments. Both the committees were scheduled in a formal format of UN. Starting with Attendance, followed by Motion to set the time for each speaker, and then moderated Caucus, followed by Unmoderated Caucus and in the end debate and solution for the issue to be passed by voting. The delegate of Georgia and Ukraine seemed quite excited with all the favours of great research and good speech. The auditorium packed even though it was on Sunday. Industrial Visit to M/S Hutamaki PPL-A Complete Package! The packaging function assumes a crucial role in all activities along the supply chain e.g. in purchase, production and transportation. Keeping above in mind, the students of PGDM/MMS-III (Operations) under the guidance of Prof. Sandeep Rasal were taken for one day industrial visit to M/S Hutamaki PPL, Silvasa on 16th September, 2016. M/S Hutamaki PPL has a rich history of global recognition in the field of flexible packaging and many other forms of packaging products. The visit proved to be very much productive where students could gain knowledge about the various types of flexible packaging and its application in industry. They could learn the development process, the substrates being used, its barrier properties, the blowing, printing & slitting function, the QMS being followed in industry, etc. Overall, the students were very much pleased with the knowledge gained during the visit and this visit has certainly taken them one step ahead in business world. Guest lecture on "Emerging Role of HR in Today’s Organization"
A Guest lecture on “Emerging Role of HR in Today’s Organization” by Mr. Avadhoot Gaitonde - Ex Vice President Group HR and Admin of UFO Moviez India Limited was organised by students of HR Specialization at the Atharva Institute of Management Studies on Saturday, 17th September 2016. The Guest speaker briefed upon the enormous opportunities available in the field of HR. He said that an HR professional need to converse with people in different arenas. He also stressed that HR acts as the base of any business. So it is important to be well-versed with the policies and procedures in any organisation you are working. He gave details on various certification courses available for HR specialization and the preparation required by students to make career. He gave some crucial tips to students which includes reading some good literature, learning continuously and re-inventing yourself. He concluded by saying that it is ultimately what you contribute to the organisation matters and the first 5 to 7 years of your career play a vital role in shaping one’s future life. Thus, it was an interactive session where students were given the opportunity to ask questions to the guest speaker and clarify their doubts or apprehensions in the field of HR. We live in a digital era where we interact and engage with our friends and family online. Social media has, without a shadow of a doubt, become central to our way of life. With this, online privacy and information security are also at greater risk. To cover these issues and challenges, an event on Social Media Security was organized in AIMS on 30th August, 2016. The honorable guest speakers were Mr. Tohid Shaikh and Mr. Ronit Yadav, Certified Ethical Hackers, who have done certification on Ethical Hacking Tech Security and Computer hacking and Forensic Investigation. The lecture was very interactive and kept the students engaged. There has been a phenomenal increase in the penetration of mobile and internet services, giving rise to security issues. The guest speakers discussed various social media threats that we regularly face in the virtual world and the steps that needs to be taken to keep our data safe. Social angler phishing, where fraudsters create fake accounts on social media and tricks the customer into giving away their credentials, personal information and financial data was covered in great detail. We also got an opportunity to understand the terminologies such as spoofing, cross site scripting, cookie and URL hacks. Further, the ways to prevent hacking and illicit activities over internet were elucidated. Overall, it was a learning experience and an insightful session. Atharva Institute of Management Studies organized their Annual Intra Collegiate Debate Competition, Tark Vitark 2016 on 3rd September 2016. The students were already shortlisted through the preliminary rounds conducted prior to the quarter finals. Hence the students were charged up for the competition. The judges for the event were our own Alumni including Mr. Parag Rane (PGDM 2011-2013), Ms. Nikita Pawar (MMS 2014-2016), Mr. Sudeep Roy (MMS 2011-2013), Ms. Isha Prabhudesai (MMS 2014-2016), Mr. Mihir More (MMS 2011-2013) and Ms. Aasmah Shaikh (MMS 2014-2016). The finale debate was power packed and the winning team was MMS Semester I followed by the runners up from the PGDM Semester I. The Best Speaker award was given to Tils Thankachan from MMS Semester I. The event ended with view points by the judges and our Dean Prof. N. S. Rajan Sir. The marketing club of Atharva Institute of Management Studies, held a Marketing Bootcamp to prepare the future marketers with all the necessary skill sets that a current day marketer is expected to possess to face the battle in the corporate world. The Marketing Boot camp on “Careers & job Roles in Marketing after Post Graduate studies in Management” was held on 27th august, 2016 at Atharva Institute of Management studies, phase 3, seminar hall. The in-house promotion activities included releasing teasers on social media, which included details of the event, desktop background across all the systems were changed with the teasers, video of the logo was played in all classes of Semester 1&3 PGDM, MMS. The Dignitaries from various industries who graced the event were Mr. Unmesh Nayak (Sr. Vice president, Reliance industries ltd), Mr. Jayesh Muzumdar (Commercial Head Corporate, Viacom 18 motion pictures) , Mr. Dilip Jayaram ( Associate Vice president ,research and consulting, Dale Carnigie Training India). Mr. Unmesh Nayak spoke about various roles and challenges in the field of marketing, he also made us understand how important is PHD i.e Passion, Hunger and Discipline to excel in life. Mr. Jayesh Muzumdar focused on how important it is to be visible, relevant and different to stand out in competition. He also spoke about where media is heading and how movies are marketed. Mr. Dilip Jayaram spoke about training and behavioural competencies which one needs to possess to manage the various roles one plays in an organisation. The event helped us to focus on functional and behavioural competencies, all the aspects and a have a working knowledge of everything to survive in any industry. The Bootcamp was indeed enlightening and enriching with lots of ideas and thoughts to ponder upon for the audience. It was indeed a very memorable day for all of us at Atharva. Higher education and development of a nation are inextricably linked. The interrelationship has been recognized for long. The Higher Education Summit 2016 was organized by Confederation of Indian Industry (CII) on 11th Aug, 2016 at Vivanta, Taj-President, Mumbai. The objective of the summit was building of robust education system in India. Today we need new structures that better reflect the diverse learning requirements of our students, we need to develop world-class capability in high-value niche areas, and we need structural changes in the higher education system to ensure greater effectiveness and efficiency. Shri Vinod Tawde, Hon’ble Minister for Higher & Technical Education and Mr. Sunil Khanna, Chairman, CII Maharashtra State Council graced the occasion through their special address. Our Dean Mr. N S Rajan, Director Mr. S Bhattacharrya and Prof. Sandeep Rasal were fortunate to witness such a great inaugural session. Nikhil Deval, MMS 2nd year student at AIMS and a member of the AIMS Entrepreneurship Cell has chalked up several milestones in a short period of time. His pharma business is now spread across quite a few segments and his company Amviens has opened couple of outlets already. Recently, he has launched three new products - APTONVET(Appetite stimulant and tonic powder), CuWound (Wound healing cream), DYSEN-GO (ANti-Dysentry). All three of the products are Ayurvedic and the formulations have been widely appreciated. Recently, in an Exhibition at Mantralaya(State Government headquarters) for rural products his two products were launched by Mrs. Pankaja Munde, Hon’ble Minister for Rural Development, Woman & Child Welfare, Government of Maharashtra. CuWound and DYSEN-GO are the two products launched by Mrs.Pankaja Munde in the presence of Mr.Pramod Jathar, MLA. During the launch, Mrs. Pankaja Munde complimented Nikhil for all the efforts and congratulated him, “ This is an excellent initiative, I appreciate your efforts, best wishes for your business.". Atharva wishes Nikhil Deval the very best in his life! Kudos to him! A Guest lecture on ‘Opportunities in Financial Sector’ & ‘How to prepare for an Interview’ by Mr. Subramanyam Pisupati - Managing Partner of ‘M/s The Capital Syndicate’, an equity / derivatives research firm was organised by the Atharva Institute of Management Studies on Friday, 12th August. The Event started with lighting of lamp by the guest Mr. Subramanyam Pisupati & Prof. N. S. Rajan, Dean AIMS and Ganesh Vandana thereafter. The Guest Speaker highlighted the enormous opportunities available in financial sector and explained about the various participants like Banks, NBFC’s, Broking and PMS Companies, Investment / Merchant Bankers, Mutual Funds, Insurance Companies, Primary Dealers and Loan Syndication Companies. He detailed about the nature of jobs available with in each participants of ‘Finance Sector’ and the preparation required by students to make career. He explained the art of writing the ‘Resume’ and specifically mentioned the “Dos & Don’ts” to be taken care. He also explained ‘How to prepare for Interview’ and informed many important points about the psychology of interviewer. Finally, he gave a very clear message to students that they never get second chance to create first impression. He also emphasized that Campus selection is life time opportunity and missing it means an uphill struggle. The NHRDN event commenced with the Dean Dr. N.S rajan welcoming the esteemed guests. This was followed by Mr. Neeraj Agarwal briefing about UDAAN event of Gladiators. Then the esteemed guest speaker Dr. Radha Krishnan Pillai gave his valuable inputs on the essence of Chanakya Niti & its learnings for HR fraternity. Chanakya Niti and its practical application in today’s world - HR industry covering a host of areas including recruiting and selection of employees, employee management, compensation and mentorship. The brief discourse given by Dr. Radhakrishnan Pillai in clear, lucid style revealed Chanakya’s teachings having relevance in today’s competitive recruitment industry. To cite, "Once you start working on something, don’t be afraid of the failure and don’t abandon it." The guests were overwhelmed by the hospitality extended by the AIMS family. The 12th PGDM Convocation Ceremony was a memorable event of Atharva Institute of Management Studies , held on 23rd July 2016 in Atharva campus. It was a wonderful farewell to the students of PGDM course which is affiliated by AICTE. Gracing the occasion with their presence were Honorable Shri Dattaji Rane Sir Ex. Higher & Technical Education Minister (Govt. of Maharashtra) & President - Atharva Educational Trust. Shri Dattaji Rane Sir declared the convocation open. It was followed by enlightening Convocation Address by the Chief Guest of the evening Mr. K. A. Narayan, President HR, Raymond Ltd. He spoke about how life outside the campus would be for the students. He gave some tips for maintaining healthy work life balance and expressed that mistakes can be stepping stone to success. Dr. S. K. Bhattacharyya, Director Atharva School of Business delivered the welcome address followed by Director, Atharva Inst.Of Mgmt.Studies Dr. P. P. Joshi presenting the annual report of the institute. Prof. N. S. Rajan, Dean Atharva Institute of Management Studies conveyed his thoughts and life lessons to the graduating students. Mrs. Narayan & Prof.Dr. Sujata Pandey also graced the occasion. Finally the students were given away their much awaited convocation certificates. Students had a big smile on their face when they held their certificates in their hand. The graduating students expressed a deep sense of gratitude, by gifting customized pens to all faculty members and a beautiful collage of photographs to our Dean. The evening ended with dinner for the recipients and their family members. Money is an inseparable part of finance and its evolution from an era of ‘barter system’ to ‘plastic money’ has taken few millenniums. To understand this better, The Atharva Institute of Management Studies organised a visit for the first year PGDM batch to the ’RBI Monetary Museum’ on 15th of July 2016. The students were accompanied by the Dean Mr. N.S. Rajan, Prof. Prabhat Varma and Prof. Radhika Rai Gupta. The museum has a rich collection of coins and information about everything to do with money, coins, notes, currency and the RBI. The Museum brings out the great numismatic history associated with India through a time line of all dynasties, foreign rulers and princely states. The Curator guided the visit, highlighting the key display and their essence in the museum. He interacted with the students explaining the evolution of money, process of minting, key recognizing factors of a confiscated money note, and touched upon many more crucial topics. The PGDM students learnt about the evolution of money, the change from stones to metals to papers and now to e-money. Apart from coins of many eras, the collection of rare Shares Certificates, Promissory Notes, Hundies of 18th Century were a treat for the eyes. They were thrilled to experience the live exchange market of currency of different countries. The visit to Monetary Museum was indeed very insightful. NHRDN’s new initiative, Udaan organised a panel discussion at Mahindra and Mahindra Ltd, Kandivali on 15th July, 2016. The topic for the panel discussion was “Talent Management and Social Media”. Students of Atharva Institute of Management Studies with HR specialization got an opportunity to attend the discussion. The main focus of the panel discussion was leveraging the use of social media to manage the human resource effectively. Mr. Dhananjay Bansod introduced the theme for the discussion and shared some insights about the significance of social media and its impact on people. Ms. Rakshita Dwivedi stressed the need of engaging employees through social media. She emphasised on the concept “ACE” where A stands for audience, C stands for Connectivity and E stands for Engaging and how these three terms go hand-in-hand together thus creating an impression on social media. Ms. Shweta Pathak focussed the need to define your target audience and stay connected with them on regular basis through social media. Also she shared that one of the best ways to engage employees is by sharing employees’ stories with the organisation on the portals and social websites. Ms. Ruchee Anand discussed about creating blogs where employees share their views and experiences at work. She stressed upon how to link talent and their employees in the organisation. Mr. Swapnakant Samal expressed that today’s scenario in digital media has changed drastically. The trend is changing from ’handbooks’ to ’hands-in’ and from ’On request’ to ’On demand’. The panel discussion concluded leaving the audience to mould their outlook towards social media and increase their connectivity with the outside world! They spoke about importance of digital marketing and how it can help us in future, as a medium to promote our products. Mr. Ronnie made us understand various opportunities in digital marketing whereas Mr. Ashok Lalla explained to us how to manage customers and their various issues. Mr. Kunal discussed about managing response of service related pages on websites. All the speakers made the conference very interactive and knowledgeable. Atharva Institute of Management Studies organized session on Leading yourself and Motivation on 8th July 2016. It was yet another brilliant session arranged by the Dean Prof. Rajan Sir. The session was conducted by Mr. Vivek Slaria, Co-Founder, Greenlatte and Ms. Anupriya Nayyar, Creative writer and Coach at Greenlatte. It was a very unique programme since it involved a scientific method for goal setting and habits. What was really intresting and new was the structural breakdown of setting habits and goals. Another key point that they highlighted through a video was the difference between a manager and leader. Its rightly said that small change brings about a big difference. And the studnets were taken by surprise when they were asked to sketch their present and the future that they wish to see for themselves. The whole session was full of fun and a lot of learning which students will be able to definitely incorporate in their life life. Also the way in which the seminar was conducted was in sync with their aim to create self inspired, collaborative and creative leaders. To sum up it would be apt to say that studnets were HAPPY TO BE THERE. Atharva Institute of Management Studies organized Induction Programme for the new joiners of PGDM Batch 2016-2018 on 1st July 2016. The new batch of students had excitement, apprehensions on their faces before commencing this new journey of their life. The programme commenced with Ms. Nikita Nimkar welcoming the students followed by the Atharva Journey through a video. Post that, Ms. Priyanka Patel and Ms. Sonam Gawde elucidated the Atharva website in detail. Prof. Rajan took over and invited a few students of the senior batch PGDM 2015-2017 to share their experience at Atharva. The students Ms. Jagruti Pathak, Ms. Saipooja Peyyeti, Ms. Dhwani Gajjar, Mr. Zuber Khan, Mr. Kunal Lokhande, and Mr. Fahad Happani conveyed their feelings and experiences of Atharva in the last one year. To give our freshmen an insight on what they can expect from the institute, the students from the current batch shared their experiences and expressed with pride their achievements and how they have been nurtured and trained to face this challenging world in the near future. All of them had one thing in common, that they were not the person that they were when they joined Atharva. They have themselves found a drastic positive change in them in last one year and all of them expressed that Atharva gave them immense opportunity to groom and grow in last one year. Post that, Prof. Rajan gave the newcomers a chance to come up on the dais and introduce themselves. The students displayed a lot of excitement and were thankful to Prof. Rajan for giving them the opportunity to speak in front of the whole audience. After the students the faculty members gave their introduction and shared their experiences. The atmosphere was filled with pride and enthusiasm as everyone came and spoke. The event ended with Dr. Sujata Pandey briefing about syllabus and Prof. Rajan welcoming the batch once again wishing them good luck for their journey of 2 years in Atharva. An interactive session was organized on 24th June, 2016 at the Atharva Institute of Management Studies for the new PGDM joiners to give a basic understanding of legal studies and its impact on business. The session was initiated by Dean, Mr. N. S. Rajan and Advocate Pooja Patil. The session began with a concise history of Judiciary and legal system in India. History of courts was explained giving focus on Rule of Law and Separation of power. Further, basic laws useful from the point of view of business were explained such as The Indian Contract Act 1872, covering agreement and essentials of a valid contract. Extra focus was given on e-contract, as these days all the agreements are entered online using electronic modes. Knowledge about other Acts like Information Technology Act, 2000, Companies Law 1956, various Intellectual Property Laws like Trademarks, Copyrights, Patents, Geographical Indications, and Industrial Design, was imparted to the students. Apart from commercial laws, few laws that are ought to be known by all the citizens were also explained, like Consumer Protection Act, Right to Information Act. Going ahead "moot court" was used as a medium for explaining case laws and legal concepts. It was held to make the students aware about the court proceedings and different case laws. Students were divided into groups of 4-5 and 4 case laws covering topics like Trademarks, Offer and Acceptance, Employee Provident Fund, Company Law, Auction Sale, were given to them. They were made to stand for Petitioners and defendants. Also, an attention-grabbing game named "Taboo" was played to explain legal jargons. All the students were divided in 2 groups and each student participated in this game making it very competitive and fun learning. Students really enjoyed the role play activity done by way of Moot court. Everyone participated and got to learn the judicial system. Overall the session was insightful and appealing, whereby most of the students developed a keen interest in field of law and their perceptive towards legal study developed. "Overview of Financial Sector - A Management Perspective"
Financial Service Industry contributes to various management profiles as it creates job opportunities in all fields of management. An insight to the working of this industry is essential to emerge in one’s career. Keeping in mind the diverse background of the students, our Dean Mr. N S Rajan, initiated a session conducted by Prof. Radhika Rai, for the development and understanding of the new PGDM joiners on 24th June, 2016 at the Atharva Institute of Management Studies. The session started with explanation of Brexit and its impact on the economic facets, followed by a brief overview of different financial markets. A short video on ‘History of Banking’ was shown, making students familiar with the barter system and development of banks, depicted in the form of animation. Further, major Financial Service Industries were explained in light of their functional roles, such as Banking, Investment banking, Equity research, Credit research, Rating Firms, Private equity, etc. Also, discussion took place regarding the money multiplying function of the banks and major currencies in the foreign exchange market, where students were asked to participate by making respective symbols on the white board. It was an interactive session where students were given the opportunity to display their knowledge and ability to present in front of a crowd. Largely, the session was taught through the mode of presentation; bringing forth factual information about the concerned industry. It benefitted the students to get a tangible representation on overview of the financial sector. Interactive sessions on ‘The Impact of Attitude in Business’ and ‘Accent Neutralization’ was taken by Prof. Kiran Nigam on 21st and 23rd June respectively at the Atharva Institute of Management Studies for the PGDM joiners. The interactive session on ‘The Impact of Attitude in Business’ started with PGDM students forming their own teams and each team had to know every basic detail of their team members. These teams had to complete a task of making a house with a pack of cards. Prof. Kiran Nigam explained the students about the importance of having a positive attitude, how it affects us, how one should maintain positive attitude and how we should change our negative attitude to a positive attitude. The session on ‘Accent Neutralization’ focused on the importance of communication and how accent and pronunciation play an important role in the corporate world. The students were asked to communicate with each other in order to understand and learn communication skills and soft skills. The sessions taken up by Prof. Kiran Nigam were certainly full of learning and fun. Atharva Institute of Management Studies initiated the Joy of Yoga session which was attended by faculty members from Atharva College of Engineering and Atharva Institute of Management Studies, along with the new batch of PGDM (2016-18). It was an enjoyable and insightful activity, contributing towards the celebration of World Yoga Day on 21st June as declared by UN and originally proposed by PM Narendra Modi in 2014. Yoga, just five minutes a day, transforms your life. Whether you are seeking health and joy or peace and love, whether it’s success in the world or inner exploration you are striving for, these simple practices are designed to help you cut through the struggle and walk through life with ease. Bringing our Atharva family closer with Yoga, Prof. Pooja Patil and Prof. Radhika Rai conducted and guided a session focusing on simple breathing and stress relieving Asanas. The session started with brief information about the history and benefits of yoga. Further to prepare the body for Yoga, basic stretching and warm up exercises were done, followed by essential breathing exercises like Anulom-Vilom Pranayama, Kapalbhati Pranayama and Shankh Mudra. Also, Surya Namaskar was demonstrated by Ms. Mayuri, our new PGDM joiner which was a workout for the entire body, making the body more flexible and agile. After the Asanas that everybody participated and performed, the meditation session to relax the mind and body was carried out. The participants were pleased to discover and learn about the undeniable benefits of yoga on mind, body and soul. Yoga is essential to lead a healthy and a fulfilling life. Rise for Good! New PGDM Joiners Visit Mahindra & Mahindra Ltd.
As a part of LEAP (Leadership Enhancement Action Plan), Atharva Institute of Management Studies arranged a plant visit to Mahindra & Mahindra’s Farm Equipment Division for the new PGDM joiners (batch 2016-18) even before the commencement of their classroom session. Our Dean Prof. N S Rajan, Prof. Sandeep Rasal, Prof. Ratheesh Nair, CMC Head Ms Piyusha Amre and Ms Nikita Nimkar along with the new PGDM joiners visited Mahindra & Mahindra Ltd., Kandivali on 17th June, 16. The session started with an introductory note by Mr. Sandeep Deshpande, Sr. Manager Employee Relations on the operations of Mahindra & Mahindra Group. He briefed the students on the farm division of the company and also the Employee Engagement Practices. This was followed by plant visit in their PU (performance unit) transmission and Engine section. It was a good learning experience for the students which will help them in relating the practical knowledge gained during the industrial visit with the classroom sessions. The students got acquainted with the job responsibilities at work place. They could relate the Production function to other functions viz. Finance, HR, Operations and Marketing and the holistic role played by each function in achieving the Production target. Quality Management and Innovation aspects were also covered which gave students an insight about the demands of today’s competitive world. Overall, the plant visit helped the PGDM students in taking them from realm of imagination to the reality of the industrial world. Indeed, an ’Excel’lent Training Session for the PGDM Joiners at AIMS! Microsoft Excel is perhaps the most important computer software program used in the workplace today. That’s why prospective employees are required to learn Excel in order to enter or remain in the workplaceand at the same time to improve the work efficiency. Not only are many business professionals using Excel to perform everyday functional tasks in the workplace, an increasing number of employers rely on Excel for decision support. Knowing the need of today’s corporate world, our Dean Mr. N S Rajan came up with an innovative idea of extending training to the PGDM students of 2016-18 batch on 10th June, 2016 on MS excel sheet (basic functions), before the academic year actually starts. Prof. Sandeep Rasal took a lead role in training the students with valued support from team members Prof. Rateesh Nair and Prof. Radhika Rai. The students were explained the features of MS Excel with suitable examples and various basic functions were covered. This was followed by an assignment. The students were very much pleased to have learnt the basic functions from where they can now look forward in developing their skills in MS Excel by exploring advanced features. In continuation with the "Expert Talk Series" for new batch of PGDM (2016-18), Atharva Institute of Management studies organized a session “Know your CMC” on Friday 3rd June, 2016. Campus Placement being one of the most sought after area of any MBA aspirant, the session was organized by our Dean, Prof. N.S. Rajan so that students get a chance to interact with CMC team. He initiated the session with a brief introduction of CMC and its members. The session was then taken over by Ms. Piyusha Amre who manages CMC. She explained how CMC aims at working towards making students employable in the industry and develops them such that they can manage their careers ahead in life. Ms. Piyusha Amre also discussed with students about year around training activities that CMC undertakes including training sessions MS excel sheet, aptitude test, resume building, mock group discussions and personal interviews etc. She advised the students were advised to make optimum use of available resources on campus, remain active on professional networking web sites to upgrade themselves on industry developments. Students should keep in touch with their faculty mentors, alumni and CMC who would help them in making better career choices. CMC member Mr. Divyesh Vala shared information on what are the industry expectations from MBAs and how students can prepare themselves for campus placements. Other CMC member Ms. Nikita Nimkar encouraged students to participate in various intercollegiate events that are held throughout the year on AIMS campus which will help them develop all round personality. Prof. Prabhat Verma, Prof. Dr. Shreeram Gopalkrishnan and Prof. Dr. Joshi spoke about how important it is to have short term goals along with long term goals as a MBA student. Also students should develop holistic approach towards management education rather than operating in specialization silos. Session was well received by the students which was evident by the overwhelming feedback from students as well as parents who attended the session. The idea of having CMC interaction with students well ahead of the commencement of PGDM course was very well appreciated by the students. Students recommended that the Institute should conduct more such informative and interactive sessions for the students. In continuation with the "Expert Talk Series" for new batch of PGDM (2016-18), Atharva Institute of Management studies organized a session “Meet Your Faculty” on Friday 27th May, 2016. As a part of Expert Talk Series, Atharva Institute of Management Studies had organized special sessions with Mr. Shariar Karim and Dr. Hariharan last week which received a tremendous response. This phenomenal response continued in this particular "Meet your Faculty" series also whereby the new batch of PGDM students got a chance to interact with the faculty members prior to the commencement of their course. This idea which was stimulated by our Dean, Prof. N. S. Rajan was found to be creative and innovative by the students. The students talked about their wonderful experience in Atharva which they received till now. Then the faculty members talked about their experience in academics as well the industry. The faculty members focused on the area of specialization and the careers in that particular field. They also gave information on the skills and attitude required for industry after two years when the students would be facing the corporate world. Post that, the session was open for questions. Students got a chance to ask queries and clear their apprehensions and doubts. Finally the students gave feedback on how the session helped them. Students could get clarity on a lot of topics related to the course. Movies can sometime teach you the biggest lessons of life! A 3 day comprehensive seminar was held in the Atharva campus from 12th May to 14th May 2016. This event was held for the PG freshers (batch 2016-18) of Atharva Institute of Management Studies. The seminar on ’I ASPIRE’ was aimed at the Heart and the objective to make the individual feel the passion to perform. By means of impactful videos, real life examples and power quotes an attempt is made to touch a chord in the heart and inspire the individuals towards aspiring to achieve more in life. The session was addressed by Shariar Abdul Karim, winner of several merit awards for excellence in service and teaching. Shariar Karim has served India’s National Carrier Air-India with distinction for over 38 years of it’s golden era, making him one of the longest serving Cabin Crew in the history of Civil Aviation in India. He has also excelled as an Instructor, training Cabin Crew for flight duties, conducting Management Seminars for Executives, as well as motivating employees through Corporate Training Programmes all over India. Currently he is helping to inspire, mould and shape the lives of young Management, Engineering and Hospitality students from various institutions, preparing them to take on global challenges. "On 21st April 2016, Prof. Dr. Sreeram Gopalakrishnan of Atharva Institute Of Management Studies was awarded the Best Faculty Award, amongst all faculties from the Management Institutes across Mumbai for the year 2014-15. The award was handed over by Mr. Keki Mistry, ViceChairman & CEO of HDFC, in a grand event organized by the Bombay Management Association. The chief guest gracing the occasion was the Honorable Minister of Railways, Mr. Suresh Prabhu. The event also had 20 students from AIMS helping the BMA core team to make this grand event a success." This is the fourth time AIMS has been awarded by the BMA. In 2014 Prof. Dr. Sujata Pandey received the best faculty award . Ruth Serrao received the best student award in 2013. AIMS also won the Dandekar Trophy in 2013. “Atharva’s Best manager” show was held on 9th of March 2016 as apart of the management games at Atharva Institute of Management Studies. This was a part of the annual -week long festival “RYTHM-2016” at AET campus. This event was initiated by the HR students Club of AIMS with an objective to enhance & unveil the management acumen among the students. The competition was specifically designed to assess the team’s leadership skills , team work, coordination, optimum utilization of resources, decision making skills, time management to mention a few. The competition consisted of several rounds based upon the intensity &criticality of each stage. A team from Thakur Institute of Management Studies & Research won the "Best manager" award followed up by the runner up team from Atharva Institute of Management Studies. The event ended up with a thank you note to all concerned at 4.55 pm. The event was also initiated by the HR students Club with an objective to assess the presence of mind & creative thinking among the students. The competition had several rounds based upon the intensity & criticality of each stage .Rohit Khade( Sem II) won the competition followed by Sushant Bagwe (Sem II) in the runner-up position. The marketing students of AIMS organized the “Marketing Premier League” as a part of the Rhythm 2016 – Management Games. The event was held with an objective to inculcate specific marketing skill sets in students. The students were tested on their knowledge of brands, their quick thinking and decision making abilities and their creativity. The PGDM - students of Atharva Institute of Management Studies were a part of the organizing committee of Rythm 2016- Short And Documentary Film Festival held on 7th March 2016 in the World class auditorium , AET campus.They were guided by Shri Sunil Rane Sir, Executive President, Atharva Group Of Institutes. The event received an overwhelming global response with around 300 entries.The event has helped the students to hone their managerial and leadership skills , grooming their personalities. The International Women’s Day was celebrated in the World Class Auditorium,on 8th March 2016 in Atharva campus as a part of the Rythm-2016 Annual Festival of Atharva Group Of Institutes. The event was graced by Madam Varshha Rane, who was the chief guest of this event. She is the Trustee AET, Director ASDPA , and also a life coach & certified trainer. She inspired the audience by her electrifying presence and soulful speech. She conveyed the message to all women -that they should be happy and just be themselves, not trying to prove anything to anyone - living life to the fullest. She emphasized that they need to remove time for themselves amidst their busy schedules. She also conducted a small meditation session Many female students, teaching and non-teaching staff of the Atharva Group were felicitated on this occassion. Atharva has always been in the forefront in this regard, of encouraging female talent in all walks of life. At AIMS- some of the prizes given were as follows- Best Faculty Female- Prof. Dr. Sujata Pandey, Best Non-Teaching staff- Female- Ms.Shefali Parab, Student Toppers- MMS- Shraddha Mhatre, Asma Shaikh, PGDM- Dhwani Gajjar, Bindal Shah. Students, Faculties, Friends & Supporters from the general public, turned up in huge numbers to support the cause. There was a feeling of euphoria and energy in the air! Demonstrating that leadership is always "Leading from the front", Prof. NS. Rajan, the Dean of Atharva Institute of Management Studies (AIMS) ran the entire Marathon to come in first in the Senior Citizen Category. He is the epitome of Knowledge and Physical fitness to both the Students and Faculty at AIMS. Amongst the other winners, AIMS PGDM Student, Ms. Jagruti Ravindra Pathak, stood 2nd Position in the Female Student Category. The ’Make in India’ Week started off on 13th February, 2016 Saturday with Prime Minister Narendra Modi first inaugurating the event at MMRDA Grounds, Bandra-Kurla Complex. It was followed by a formal launch of the event at NSCI in Worli. The event showcased India’s potential in the manufacturing sector and woos foreign investors. The event offered foreign investors unprecedented access and opportunities to connect and collaborate with young Indian entrepreneurs, industry leaders, academicians and government officials. The week-long event had over 2,500 international firms and 8,000 domestic companies that participated. The event was attended by foreign government delegations from 68 countries and business teams from 72 nations. The Prime Ministers of Sweden, Finland and Lithuania, and the Deputy Premier of Poland and foreign delegates from a number of countries who attended the event. As many as 30 government and business leaders from Australia participated in the ’Make in India Week’. Indian industry leaders like Tata Group Chairman Emeritus Ratan Tata, Tata Group Chairman Cyrus Mistry, Reliance Industries’ Mukesh Ambani, Piramal Group’s Ajay Piramal, Birla Group’s Kumar Mangalam Birla, Mahindra & Mahindra’s Anand Mahindra and Adani Group’s Gautam Adani were the part of the event. As many as 17 states, mostly BJP-ruled ones, had participated and there were around 52 seminars that were attended by top executives of leading firms, both domestic and global. "It’s for the first time that around 3,000 bilateral meetings -- business to government and business to business – that were held during these seven days," Amitabh Kant said. A solar panel manufacturer from China is likely to make a big investment in the state, an official from Chief Minister of Maharashtra’s office said. "The name of the company would be known after the memorandum of understanding (MOU) is signed. The company has asked us for 3,000-5,000 acres of land for its solar panel manufacturing unit. This will be the largest project of such a type in Maharashtra," the official added. “Make in India” a platform for showcasing innovation and exhibiting new ideas. Getting a chance to work for such a mega event wherein we get a learning exposure is a huge opportunity. We Atharvities got the a chance of life time, were in we learned to handle the B2B (business to Business), B2G (business to Government), G2G (Government to Government) Meetings, We also assisted and escorted Dignitaries from various companies, a huge number of these dignitaries were from overseas who were present for the event with an intension of Exchanging new ideas, building relationships with business as well as the government of India and expanding their Business. We worked in collaboration with the CII (Confederation of Indian industries) who we were the associate partners of make in India event, we along with CII and other Premium Colleges students from IES college, arranged seminars like the Hackathon event which was attended by the prestigious colleges like IIT Bombay and was addressed by speakers like Devang Khakhar Director, IIT Bombay, Mumbai. In all we got a wonderful chance to observe learn and work for the whole event and also learn the working, administration of the event. The “Team Sprit” was flashing all around us without which we could not make the event a grand success. Being a part of such a mega event was a very good learning experience. We would like to give our sincere regards to Shri. Sunil Rane Sir & Prof N.S Rajan for giving us this wonderful opportunity & Prof. Paul Rosario for assisting us throughout the event. Ravi Verma is a marketing professional with over a decade of experience in managing some of the biggest and most exciting brands of the country including Tata Safari and Park Avenue. He is the Founder & CEO of Jermyn Brands, a fashion & lifestyle company and Co-Founder of BootCamp Learning. As a marketing head of Park Avenue,he led the brand to feature among Economic Times India’s Most Exciting Brands for 2014 and 2015. He was also awarded 100 Most Influential National Leaders in Marketing citation in July 2015 by CMO Asia, World Marketing Congress, World Sustainability and World Federation of Marketing Professionals & Won Award for Marketing Excellence in Retail Sector for Park Avenue at the World Marketing Congress. The discussion was lively and interactive. The speakers highlighted their radical views on women empowerment, certain challenges faced by women leaders and the ways of overcoming them. Indian society has contributed to women leadership and women do add value to the organizations. The key takeaway point is that women need to be treated as human beings and at par with men. HR Panel Discussion by the HR club of Atharva Institute Of Management Studies was held on 5th February, 2016. The topic for discussion was “Innovative HR Practices”. The panel discussion was very interesting and enriched the students with insightful discussion and question and answer rounds . Prof. N. S. Rajan, Dean introduced the theme and shared his Air –India experiences along with certain cases of innovative HR practices in academia- industry interface. Dr.Aneeta Madhok stressed the need to create an innovative HR model to deliver organisational excellence. Mr. M.S. Venkatesh focussed on the challenges faced in acquiring, engaging, influencing & retaining employees to provide best customer service in the hospitals, with examples of the best HR practices. Mr. Milind Rane shared his unique experiences in Industrial Relations and the upcoming trends in HR like use of robots for interviewing candidates!! But he emphasized that the human touch would always prevail in the final selection and decision making. Mr.Nitin Shekhar discussed about several best practices used, emphasizing the importance of employee engagement programmes and implementation of “innovation meetings” which boosts the creativity of employees in organisations. Ms. Amrita Shetty played a great role in moderating the entire event and engaged the audience with her candid remarks and observations. She electrified the panel discussion with several interesting questions. The panel discussion was followed by questions answer round and “HR Voices” (magazine)launch by the guest speakers. This magazine contains several interesting articles written by the students of HR specialisation both from MMS & PGDM ( Batch-2015-17). The panel discussion concluded leaving the audience enriched with several more thoughts to ponder upon and research !!! The First Business Games Presentation at AIMS for MMS students was conducted over a three day period from January 18th 2016 and saw hectic competition among the seven short listed teams. In a series of indepth presentations the students of AIMS displayed a combination of creativity and strategy and the Winner was Team AFT. The team launched a new multipurpose footwear brand which simply caught the imagination of the jury and the audience. The first runner up was Team Solstar which came up with a features packed solar powered charger while the second runner up was Icarus which conceived of a new digital pen capable of cloud storage interface. All the other participating teams also came up with several innovative products. The presentations were laced with humour, product insight, research and even included advertising commercial that were produced exclusively by the student members. The judges for the event, Dr Bhattacharya, Col Raje, Dr Sujata Pandey and Prof Priyanka Oza asked indepth questions at the presentation and grilled the members of the team on various functional, operational and financial issues. Prof S.Gopalkrishnan mentored all the teams and was the coordinator of the First Business Games in AIMS. The presentations were styled in a Business Game model with each Student taking on Functional responsibilities like CEO, Marketing Head, Design and Production Head etc. The teams were also formed with company names and conceived new products and services from scratch. Atharva Institute of Management Studies and Atharva School of Business conducted 11th PGDM Convocation Ceremony of the PGDM Batch 2013-2015 which is affiliated by AICTE. Also the students of Executive MBA and Diploma in Event Management also got graduated under the umbrella of Atharva School of Business. The event witnessed a wonderful presence of the graduates with robes and hats all exited to get their convocation and live their moments again in the institute. The Guest of Honour of the event was Hon’ble Shri Dattaji Rane, Ex. Higher & Technical Education Minister (Govt. of Maharashtra) & President - Atharva Educational Trust. Shri Dattaji Rane Sir declared the convocation open. The Chief Guest of the event was Mr. Rajesh Gupta - Associate Vice President- HR (Future Generali India Life Insurance Company Ltd) who gave the convocation address to the students about the challenges they will be facing in life ahead and how to overcome them. Finally the students were given the certificates and mementos with wonderful memories to be carried along with them. Prof. N. S. Rajan in his remarks stressed on the students the importance of performance in the business environment which they have entered. Dr. Subir Bhattacharyya also emphasized how Atharva has groomed them to be a success in the corporate field. Dr. Prakash Joshi gave his report for the financial year. The convocation ended with a dinner for the recipients and their family. Rhythm always starts with a marathon followed by various management events like 1. Business Mela 2. Entrepreneurship 3. Ad Mad 4. Situational Act 5. Mock Stock 6. Treasure Hunt 7. Case Study 8. Spinning the yarn 9. Auction Apart from the managerial events mentioned above the following events like: - Fashion Show, Dance competition, Rock band, Drama competition prom night take place where all atharvites (Engineering, Hotel Management, Management, IT and fashion come together to celebrate it. 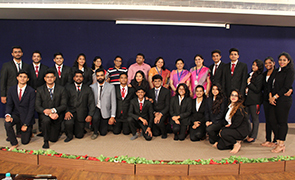 The Induction Programme of MMS Batch 2015-2017 was held on August 3rd, 2015 by Atharva Institute of Management Studies. There was a lot of excitement in the air as it was the first day for the students who were going to be a part of Atharva for coming two years and even after that. The event was compeered by Prof. Priyanka Oza and started with blessings of Lord Ganesha. The students were taken through the journey of Atharva which was really motivating and inspiring. Also present at the event was Ms. Ruth Serrao who is Alumni of Atharva Institute of Management Studies, Batch 2012-2014. She is currently placed as a Senior Business Associate at Crimson Interactive. She was kind enough to spare some time from her schedule and address the students as how their journey is going to be and what they should be looking forward in these two years. She talked about her experience at Atharva and her achievements which included Best Student Award from the Bombay Management Association. She shared with us how Atharva helped her in grooming her for the corporate life. Post that, the Senior students of batch 2014-2016 shared their experiences with the upcoming batch as to how they have changed from the time they entered the institute till now and how Atharva has given them the confidence to speak in front of such a large audience. And eventually the students of Batch 2015-2017 introduced themselves followed by the faculty introduction. The event ended with a small talk by our Dean Prof. N. S. Rajan which was really inspiring and thought provoking. On 11th August 2015, Atharva Institute of Management Studies conducted an induction program to welcome its new students. The event was compered by our very own Prof. Paul Rosario. The induction program had a very motivational kick start. Each student was made to sing and feel like a champion when the song ‘stand up (for the champions)’ was played with the lyrics on the projector screen. The atmosphere in the hall was filled with positivity and euphoria. For any event or seminar conducted, Atharva Institute shows its achievements through a video which showcases its world class infrastructure. The PGDM students of the current batch took up the initiative and created a new video which left everyone with a feeling of pride of what the institute has achieved so far and what more is yet to come. The guests of the event were Mr. Neil Sequeira (Vice President - Human Resources and Administration at Kokilaben Dhirubai Ambani Hospital) and some alumni students of the PGDM batch in Atharva Institute of Management Studies. Mr Neil Sequeira shed light on what are the challenges one has to face and with what frame of mind one should see these two years of professional education. He said that, enjoy life to the fullest but at the same time strive to achieve your goals. He ended the session in a unique way by sharing a couple of inspiring bollywood dialogues and told the students to live every moment as if it were your last. The alumni students shared their years journey of being in the institute along with their industry experience. To give our freshmen an insight on what they can expect from the institute, a few students from the current batch shared their experiences and expressed with pride their achievements and how they have been nurtured and trained to face this challenging world in the near future. One cannot overlook the united efforts put in by PGDM and MMS students of the current batch, who made this event a success. Thank you. Number of students attending : With just 3 student attending the last alumni meet held in May 2015, the biggest challenge for the current team was to have a good number. Invitation mail was sent first, followed by personal calls and reminder email. A Facebook page was also created as a part of digital advertisement. As a result we had 88 student attending the event. Time limit : Budget being approved with just one week in hand for the event to roll in, Cultural team which included a dance , song and skit did a flawless job which not only mesmerized the audience but also made them laugh their lungs out. Executive Summary : A green signal from the Dean Prof N.S. Rajan let the ADIOS-2015 team gear up to give final see off to their seniors (2013-15) batch. In AIMS we believe farewell is just the formal way of saying “Good bye”. In reality this is actually the start of an everlasting relation between the college and the students. Every management student understands the value of being able to express one’s self clearly and concisely with that motto ATHARVA INSTITUTE OF MANAGEMENT STUDIES, conducts The TARK- VITARK Debate Competition on an annual basis and this year it was held on the 3rd of September 2015. The event envisaged by The Executive President Mr. Sunil Rane, helped the students to speak up and learn to support their ideas through engaging topics that gave them a platform to showcase potentials. Students were able reflect on different ideas, opinions, beliefs and values when exploring topical and controversial issues and problems in the current scenario. The winning teams put up convincing arguments that took account of, and represented different viewpoints, which provoked others to think again, change and support them. Rohan Salian, Vinay Singh, and Pranav Patil. (1st year MMS). Sumitrabali Sawant, Arshi Hussain (1st year MMS), Kanchi Vora (1ST year PGDM) and were awarded cash prizes and certificates for their outstanding performances. The debate competition evoked a spark among students and persuaded them to participate in various competitive events which encourages students and moulds their outlook which preparers them for the corporate world.